A version of the OnePlus 6T flagship that's all about speed, the OnePlus 6T McLaren blusters with an ultra-high-end (as of this specs-driven review) 10GB LPDDR4X RAM and a bevy of the autosport brand's signature design elements. 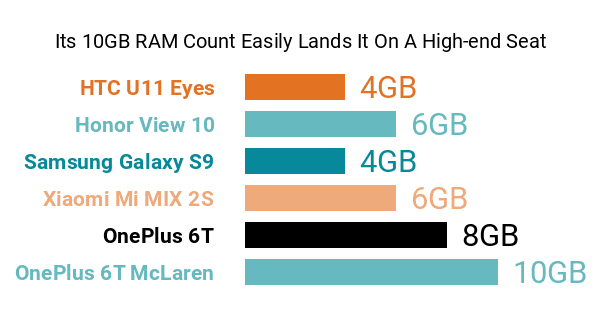 Note that it also comes with lower-specked versions offering only 8GB and 6GB of RAM accordingly -- check out this Phonerated list of 8GB-RAM flagships. Its colossal RAM works hand-in-hand with a 2.8GHz octa-core Qualcomm Snapdragon 845 processor , a chip that supported the pros and cons of some of the fastest smartphones on the market when this McLaren Edition came out. Also joining in as an upmarket Adreno 630 graphics processor. Going back to its McLaren pedigree, the 6T McLaren rocks a carbon fiber backing alongside the McLaren badge and a Papaya Orange lining, making it resemble an actual McLaren race car. Inside its premium-class shell, though, is a rather uninspired 3700mAh battery (Some of its high-end rivals pack 4000mAh cells) that at least comes with the OnePlus's Warp Charge 30 technology, promising to replenish a day's worth of battery life after a 20-minute charge. Another con is its lack of support for memory expansion , although its 256GB or 128GB internal storage sounds just about right for a 2018 flagship contender. Its high-class profile is also marred by the 1080p-only resolution on its 6.41-inch 19.5:9 Optic AMOLED screen -- we expected a QHD/QHD+ (1440p) sharpness, considering its high-octane hardware components. Nevertheless, its aforementioned display could wind up as a pro for some tech-savvy shoppers, seeing that it comes with a damage-resistant 2.5D Corning Gorilla Glass 6 finish and an in-display fingerprint reader . As for its photography perks, this OnePlus model boasts a 16- plus 20-megapixel dual-lens primary camera enabled for 4K-2160p video-recording and AI-aided photography. 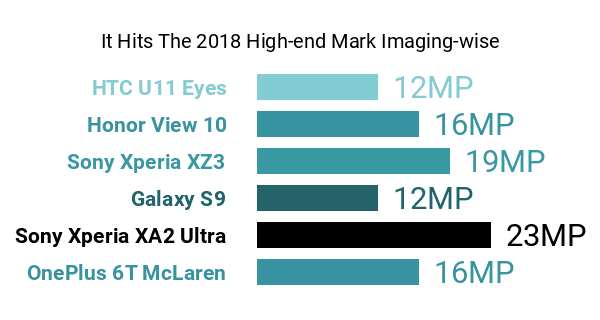 Additionally, its 16-megapixel front cam, although sadly a fixed-focus one, sounds just about satisfactory for a 2018-released high-ender. The 6T McLaren's pros and cons also include an LTE Cat 16/13 network adapter promising a 1Gbps maximum data rate, two nano SIM card trays, and OnePlus's self-branded OxygenOS (based on Android 9.0 Pie). Summing up, the OnePlus 6T McLaren is a performance-first phablet whose monstrous RAM count and classy design features possibly give it an edge versus most of its competitors in the high-end smartphone race.